The holiday season is in full swing! Houses are decorated with festive lights, stores have holiday gifts front and center, and a feeling of cheer seems to float in the air. December is an important time as it has many holidays for people of all different backgrounds and beliefs. So, as you gear up for the holiday(s) of your choice, here is a guide to some December celebrations around the world. Hanukkah, or the “festival of lights,” kicks off the December holiday season. According to the Jewish calendar, it begins on the twenty-fifth day of Kislev and is observed for eight days, which in 2018 is December 2-10. The holiday came into being when Jewish rebel warriors defeated invading Greeks. They sought to rededicate their desecrated temple, but there was only enough oil to light the menorah for one day. Miraculously, the oil lasted eight days. In celebration, a menorah is lit, one candle each night, until all are kindled on the last day. The importance of oil is also celebrated with customary fried foods like latkes (potato pancakes) and sufganya (jelly-filled doughnuts). Children play with a dreidel, or a four-sided spinning top, and receive Hanukkah gelt, or money, from older relatives. Bodhi Day falls on December 8. It celebrates the day Siddhartha Gautama, or Buddha, attained enlightenment. Gautama, a prince of Nepal, left his luxurious lifestyle to seek the meaning of life upon seeing the suffering of human beings. After years of traveling and seeking, he sat under a Bodhi tree with a vow to fast and meditate until he found the answer. On the eighth day, he came to a number of realizations that would become the foundational principles for Buddhism. Celebrations of Bodhi Day vary widely between sects and can range from visiting shrines for additional meditation to performing kind acts and decorating the family Ficus tree, the species to which the Bodhi belongs. Rice and milk play an important role, as this was the first meal Siddhartha was offered following his enlightenment. Some families also make heart-shaped cookies like the leaves of a Bodhi tree. Pancha Ganapati is a modern Hindu festival celebrated December 21-25. Created in 1985 by Sivaya Subramuniyaswami so Hindus could have something to celebrate during the Christian-dominated holiday season, the festival centers on Ganesha, the elephant-headed god of beginnings, knowledge, culture, and the removal of obstacles. A shrine with Ganesha at the center is created in the living room. Children dress the statue in a different color each morning to correspond with that day’s color and theme. The first day, for example, is yellow and celebrates family. Offerings are made to Ganesha, and children open gifts on the fifth day. Kwanzaa, celebrated from December 26 to January 1, is another modern holiday. It was created in 1966 by Dr. Maulana Karenga, an activist and professor of Africana studies, so all black people could have an alternative holiday to celebrate. Inspired by the “first fruit” harvest festivals in Africa, Kwanzaa is guided by seven principles (Nguzo Saba) that are the basis for strong community. One such principle is ujima, which means collective work and responsibility. Seven candles (Mishumaa saba) represent the principles of the holiday, and a candle is lit each day to celebrate the respective principle. Seven symbols are also used to decorate and represent Kwanzaa. Children receive gifts on the last day. Omisoka (Japanese New Year’s Eve) was traditionally celebrated on the last day of the lunar calendar, but since switching to the Gregorian calendar now falls on December 31. This holiday centers on preparing for the clean slate of the New Year, while concluding the current year. People spend the day cleaning the house, decorating, paying off debts, bathing, and cooking large quantities of osechi, or traditional Japanese New Year foods. It is considered unlucky to cook in the kitchen or handle errands for the three days following New Year’s Eve, so it is important for people to complete the tasks before the end of the current year. Right before the end of the year, people gather to eat toshikoshi soba or toshikoshi udon. These long noodles represent long life. At midnight or in the following few days, people visit Shinto shrines or Buddhist temples for Hatsumode, the first shrine visit of the year. Amazake, or sweet sake, is traditionally passed out to crowds praying at the shrines. Christmas is the most widely recognized December holiday, and as a result, Santa Claus has become an instantly recognizable symbol. Mall Santas aside, there is a real one that comes around with presents for all the nice children . . . right? In Bah! 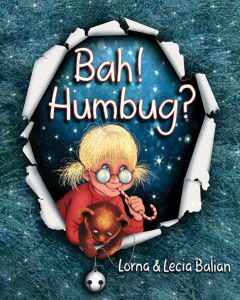 Humbug by Lorna and Lecia Balian, Margie’s older brother does not think Santa exists, and he sets out a Santa trap to prove Margie wrong. But a little holiday spirit can go a long way. From all of us at Star Bright Books, happy holidays! This entry was posted in Holidays and tagged holiday books, picture books on December 6, 2018 by starbrightbooks. Thanksgiving is just around the corner, and many people are already planning what to cook for their dinner spread. While feasting and giving thanks this season, consider the true origin of this long-standing tradition. The idea of Thanksgiving has changed quite a bit in the few hundred years it has been around, but how did it become the ingrained celebration it is today? 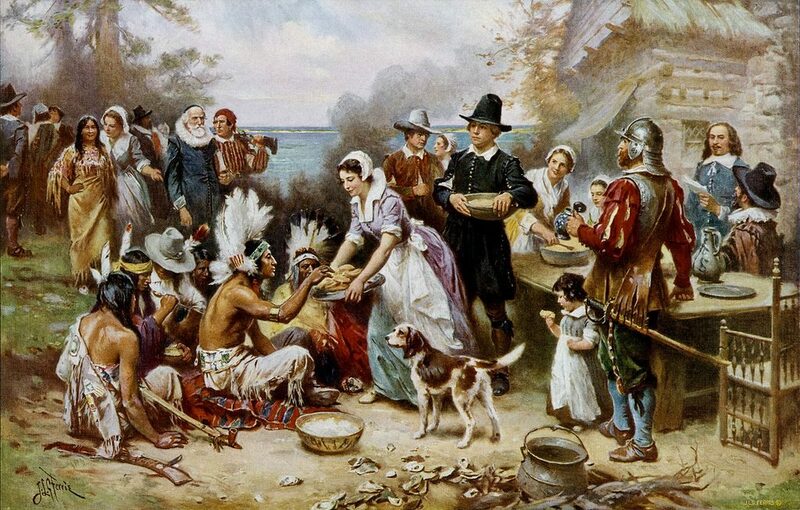 Modern-day Thanksgiving celebrations still heavily rely on the myth of the joyous first Thanksgiving feast between the Pilgrims and the Wampanoag tribe. However, it is important to know the true context from which this holiday was born to help prevent further erasure of the injustices inflicted upon Native Americans. While this does not make up for the past, it is certainly a step toward recognizing the oppression indigenous tribes have faced, and still face today. “The First Thanksgiving” by Jean Leon Gerome Ferris, which depicts the romanticized version of the holiday. The common knowledge of the holiday depicts the first Thanksgiving as a harmonious meal between the Pilgrims and the Wampanoag tribe in 1621. The Wampanoag extended aid to the Pilgrims, who were near starvation, by bringing them much-needed supplies and teaching them how to grow their own crops. To commemorate their alliance and an abundant harvest, the Pilgrims invited the Wampanoag to a three-day celebration. This, however, is a misrepresentation of the true history behind Thanksgiving. Although the feast did take place, the situation was quite tense. The two groups were distrustful allies who partnered up out of necessity. The Wampanoag needed more people to defend against other tribes; the Pilgrims viewed the Wampanoag as uncivilized, but were at great risk of dying out without aid. An influx of colonizers and a change in leadership on both sides ended the temporary peace. After the relationship dissolved, the possibility of fostering similar peace treaties squickly soured. Increasingly, historians are pointing to a much darker event as a precursor to Thanksgiving: the Mystic Massacre. The Mystic Massacre was the culmination of the Pequot War, a three-year struggle with colonists over the tribe’s land. In 1637, Puritan forces and their Native allies launched a surprise attack on the Pequot tribe as they celebrated their own Thanksgiving in present-day Mystic, Connecticut. Colonial forces surrounded the Pequot tribe’s enclosed settlement and set fire to it, effectively trapping and murdering the people inside, from warriors to children. The Mystic Massacre and two similar bloodbaths decimated the Pequot tribe. Surviving members were either sold into slavery or assimilated into neighboring tribes. Massachusetts Bay Governor John Winthrop expressed gratitude for the successful destruction of the tribe, and thus every massacre thereafter was subsequently followed by feasting and giving thanks. In 1789, under the new US constitution, George Washington issued the Thanksgiving Proclamation, but the holiday was only recognized in the New England states for many years. Sarah Josepha Hale, an author and editor most famous for writing “Mary Had a Little Lamb,” started a campaign to have Thanksgiving recognized as a national holiday in 1827 by sending letters to the president, starting with Zachary Taylor. Her efforts paid off with Abraham Lincoln. Seeing an opportunity to unify the country in the middle of the Civil War, Lincoln declared Thanksgiving a national holiday in 1863. Although the Civil War would not end for another two years, Thanksgiving entered the public consciousness as a moment when two opposing factions could peacefully come together. Similar to many aspects of modern-day Thanksgiving celebrations, turkeys did not rise to prominence until fairly recently. This particular tradition also came about thanks to Sarah Josepha Hale. In 1854, Hale heard the journal of William Bradford, former governor of Plymouth Colony, had been rediscovered. She became fixated on one innocuous sentence about the Pilgrims hunting wild turkey in the fall. Eating turkey for Thanksgiving was never stated in Bradford’s account, but Hale began publishing recipes for roasted turkey in conjunction with the holiday and the pairing gained in popularity. Turkeys are now synonymous with Thanksgiving, but what if the turkey you want to eat is your friend? 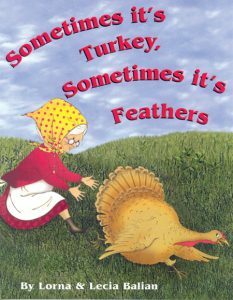 In Sometimes It’s Turkey, Sometimes It’s Feathers, written by Lorna Balian and illustrated by Lecia Balian, Mrs. Gumm raises a turkey to eat on Thanksgiving, but her plans go awry. This twist on tradition will help children understand one part of modern-day Thanksgiving customs. Next time you and your family are at a Thanksgiving dinner with a roasted turkey on the table, take a moment to remember the long history of this holiday. This entry was posted in Holidays and tagged holiday books, picture books on November 6, 2018 by starbrightbooks.